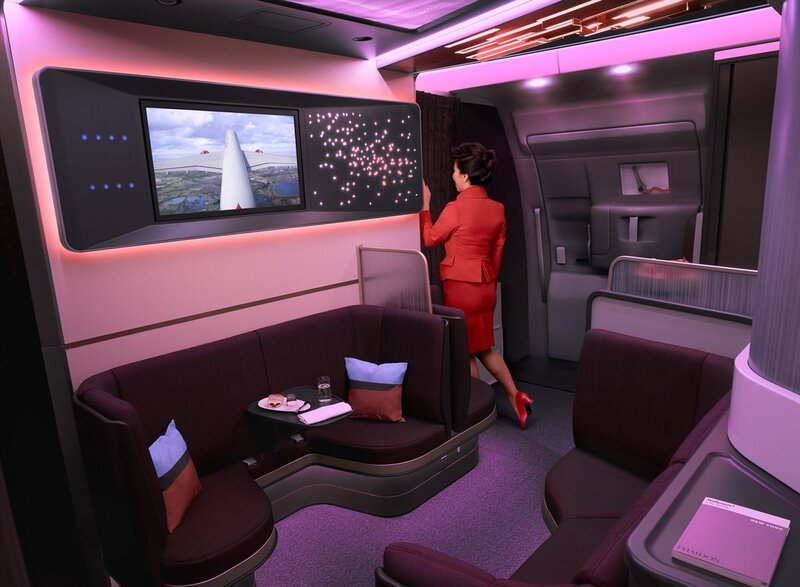 UK long-haul carrier Virgin Atlantic has redesigned its upper class cabin to include an eight-seat lounge called “The Loft” on its new Airbus A350-1000 fleet, replacing its existing upper class bar area. “When I joined the company five years ago, we had a very simple mission statement: fix the financials of Virgin Atlantic—get it back on an even keel without destroying the magic. As you will see, the magic is still there,” new Virgin Atlantic CEO Shai Weiss said, speaking at the A350 cabin launch event at Virgin’s Gatwick headquarters on April 8. Virgin has 12 Rolls-Royce Trent XWB-powered A350-1000s on order, scheduled to join the fleet by 2021. The new cabins will launch on Virgin’s Heathrow-New York JFK route in August, followed by other routes to JFK later in the year. The Loft is a lounge area near Door 2 that all passengers will pass through as they enter the aircraft, but it is reserved for Upper Class-traveler use during the flight. “We’ve now evolved the bar and we’ve taken it to new heights. We’ve literally brought alive the whole Club House [airport lounge] experience at 35,000 ft., so that upper class customers can socialize, meet, greet and play in that area,” Virgin Atlantic EVP-customer Mark Anderson told ATW in an exclusive video interview, filmed on site at the Gatwick launch. The Loft will still have a drinks service, but the area is designed to be more of a seating, dining and socializing area. It is equipped with a single 32-inch screen for watching short films and documentaries, with audio accessed via Bluetooth headsets (provided by the airline, or the passenger). There are also USB and mains power sockets around the seats, which cannot be used for takeoff and landing, but have seat belts in the event of turbulence.